Kayak Carrier Systems Easy Haul kayak trolley portage strap long term test and review. 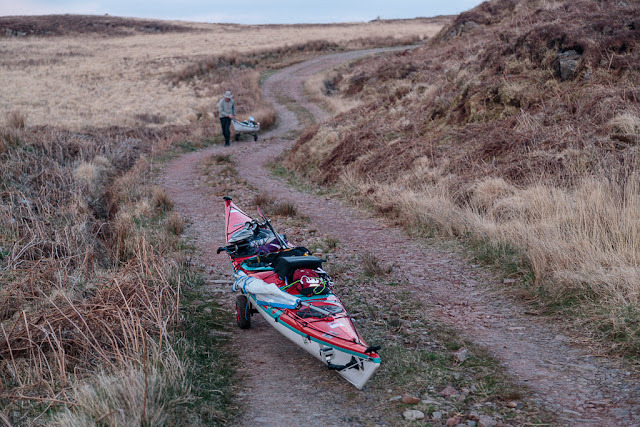 I am a great believer in using a kayak trolley, not just for short getting to and from the water but for longer portages of isthmuses that enable round trips that would not otherwise be possible due to time or geographical constraints. 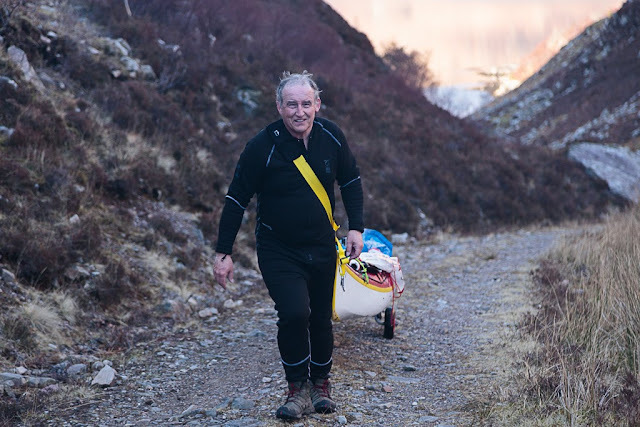 This photo was a portage over the 1.2km Tarbert on Jura but our shoulders arms and hands were really sore at the end of it. Just look how Tony is twisted round, trying to share the load between both arms. 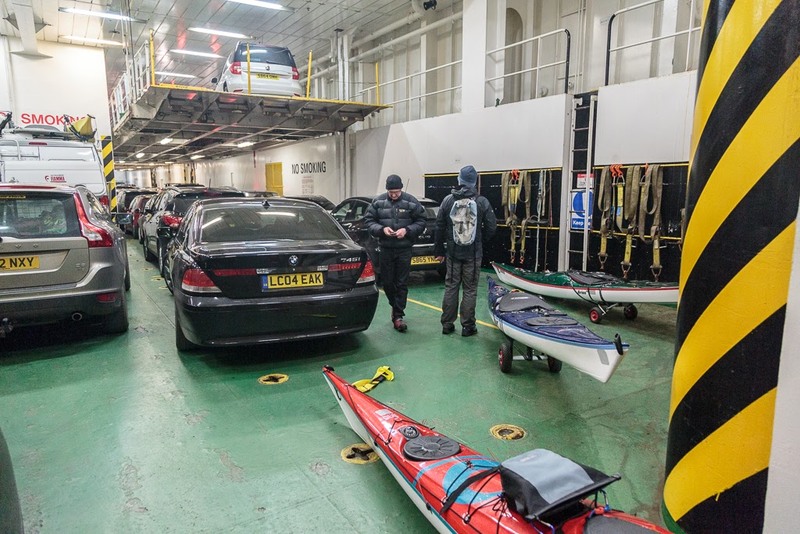 Trolleys are also great on ferries but don't underestimate the distance you need to trolley the kayaks round the terminal, the length of the car deck and then the off ramp to wherever you can launch from. I have been testing a new custom made trolley portage strap from KCS called the Easy Haul since October 2015. It has been used on the Solway, the Clyde and the NW coast of Scotland. It has been used on tarmac, rough tracks, ferry decks, sand and shingle. The test has now covered over 13km and 220m of ascent and descent. The Easy Haul consists of a broad shoulder strap, shoulder pad an adjustable short towing strap and a carabiner. 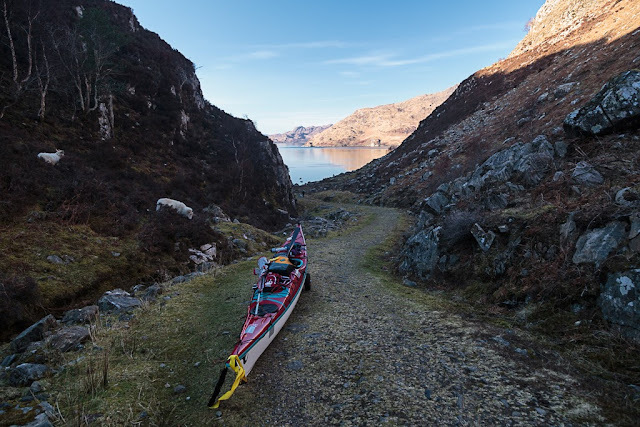 On the Scottish west coast one of the most notorious portages is that at the Tarbert between salt Loch Nevis to freshwater Loch Morar. The track is 1.2km long rises to about 100m from Nevis and falls about 90 to Morar. ...I made it to the top first and Maurice and Mike were nowhere in sight. 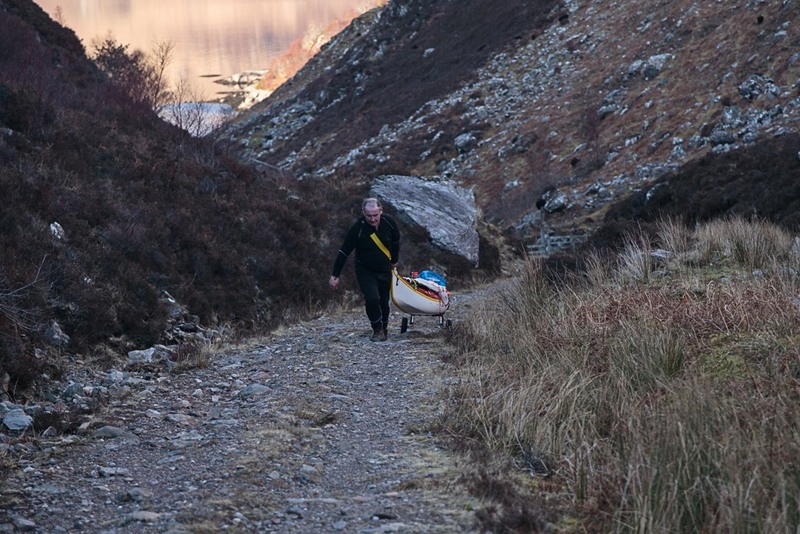 I even went back and towed Maurice's kayak 1/3 of the way up the hill. The Easy Haul is a stunning success and with both arms free you could even use two walking poles for extra drive. One thing to watch for, if you are attached to a loaded kayak, do not go too near the edge of any drops! !